Are Some of Your Aging Adult's Emotional Reactions Due to Vision Loss? Are Some of Your Aging Adult’s Emotional Reactions Due to Vision Loss? Home Health Care Collierville TN – Are Some of Your Aging Adult’s Emotional Reactions Due to Vision Loss? An aging family member who is losing her vision might react in some seemingly odd ways. She might be more emotional than usual, too, or expressing her emotions in some ways that are out of character for her. While you might feel that your elderly family member losing her vision is a natural part of the aging process, your senior might look at it much differently. For her, a sense that she’s had access to for the majority of her life is no longer functioning the way that it should be. This is a loss for her in the deepest sense and her emotional reactions tend to have their basis in grief. 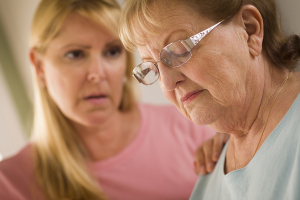 Besides grief, your elderly family member may be wrestling with other emotions, too. Some of the more volatile emotions you’re likely to see her experience could include shock, anger, and denial. All of these may also come and go depending on what else is going on in your senior’s life at any given time. It’s really important that you acknowledge your elderly family member’s feelings and that you avoid telling her that they’re ridiculous or unfounded. The problem with that is that feelings are neither good nor bad and they’re neither right nor wrong. Feelings just are. This is called validating your senior’s feelings and it can go a long way toward helping her to work through them. Let your aging adult know that she’s safe and not a burden for you or for anyone else who helps her. When she understands that you’re doing everything that you can to help her remain as independent as possible, she can relax into the process a little more. One way that you can help your elderly family member to remain independent is to learn how to work around her particular vision issues. Your senior’s eye doctor can help you with this and put you in touch with other agencies that can help. It’s also a good idea to hire home health care services providers who can help your elderly family member with activities of daily living. The less your aging adult feels as if she’s going to lose her independence the better she’s likely to handle losing some of her vision. For Home Health Care Services in Collierville TN, please contact the caring staff at Personal Care Services MidSouth today! This entry was posted in Home Health Care Collierville TN, Personal Care Tips and tagged Home Health Care Collierville TN. Bookmark the permalink.